offered before choosing your supplier. Obviously you need to determine which type of refreshments to offer to your staff and visitors (hot drinks, cold drinks, snacks, some or all of the above...) before selecting a vending machine supplier. But there are other considerations which are also critical to optimising your investment. An improperly installed vending machine can present safety risks including electrical faults, damage to water pipes or even toppling over if it’s placed in an unstable position. There may also be health risks to users of food and drink vending machines if, for example, the refrigeration system is not properly set up or if the connection of a vending machine to water mains is not carefully insulated against leaks and other hazards. 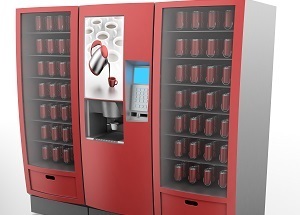 As a result, most vending machine suppliers include professional installation and set-up services, whether you purchase or rent your machine. A quality vending machine supplier will include regular stock replenishment as well as servicing and maintenance of your machine. Some suppliers can also be flexible in terms of which brands of products are supplied, and certain items for sale can be swapped for others, though rarely in the case of branded vending machines (Coca Cola, Mars, etc. ).